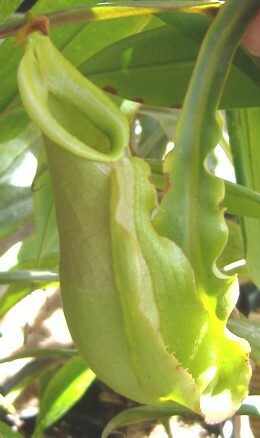 Nepenthes mirabilis "winged" X veitchii highland striped is an Exotica Plants hybrid between a lowlander and a highlander. They recommend growing this plant as a lowlander. The leaves are somewhat papery and I'm currently growing it as a bedroom plant. It's now starting to produce pitchers for me. The winged tendril is really bizarre. It's like the tendril is making a second leaf! The pitcher is kind of bland but I attribute that to growing this hybrid in less than optimal conditions. I think in a greenhouse or under lights there would be more color than what I've seen so far. 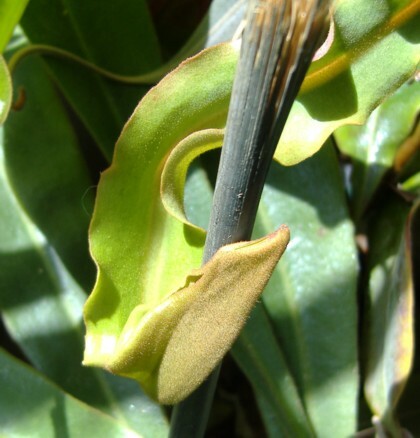 There hasn't been many photos of this hybrid yet in any of the forums to compare my plant to so I don't know how much variability there is within this hybrid. I purchased this plant because of the N. veitchii highland stripe as a parent. That species is one of my favorites. I'm not good at growing lowlanders but this guy seems to be doing pretty well so far. Any hybrids with N. mirabilis give me a lot of trouble because they need higher humidity that I can't provide but this hybrid seems to have enough N. veitchii in it to offset lower household humidity.